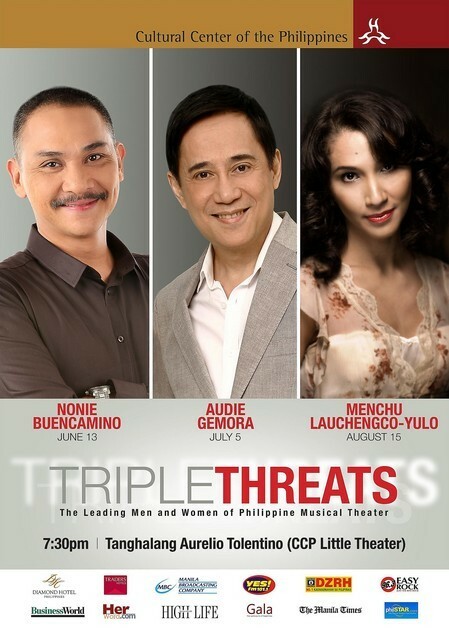 Triple Threats: Leading Men and Women of Philippine Musical Theater is a series of solo concerts featuring the stalwarts of Philippine Musical Theater. Each concert is an intimate evening of beautiful music, personally selected by the artists themselves, from their vast repertoire of favorite songs from Broadway, West End, original Filipino musicals and the movies. Dubbed as a series of “concept concerts”, the narrative of the performance is dictated by the song choices. A particular field who exhibits three skills that are necessary to excel. In this case, our “Triple Threats” ? Nonie Buencamino, Audie Gemora and Menchu Lauchengco-Yulo - can sing, act and dance. Opening the series on June 13, 2013 is “Much Ado about Nonie” featuring acclaimed actor Nonie Buencamino. Nonie is very much visible on stage, television and film, having done straight plays and musicals while appearing in daily television series as well as independent and mainstream cinema. Prior to the concert, Nonie portrayed the King of Siam in “The King and I” at Resorts World Manila. He's also part of an afternoon daily series produced by ABS-CBN entitled “Dugong Buhay”. His concert will take his audience on a personal journey from theater to mainstream show business with a mix of the two in between. Leading a five-piece band is musical director Jed Balsamo. Guest artists include Ms. Mitch Valdez, daughter Delphine Buencamino and wife Shamaine Centenera-Buencamino. Not to be missed on July 5 is the second concert of the series featuring multi-talented Audie Gemora. Though his name is primarily associated with theater, Audie is also one of the more respected singers in the local music industry. He recently cut a Broadway album entitled “Playlist”. He won an award for “Best Performance as Male Lead in a Musical” at the Gawad Buhay Awards of Philstage for his performance in “Sweeney Todd”. He recently starred opposite Joanna Ampil in Resorts World Manila's “The Sound of Music”. 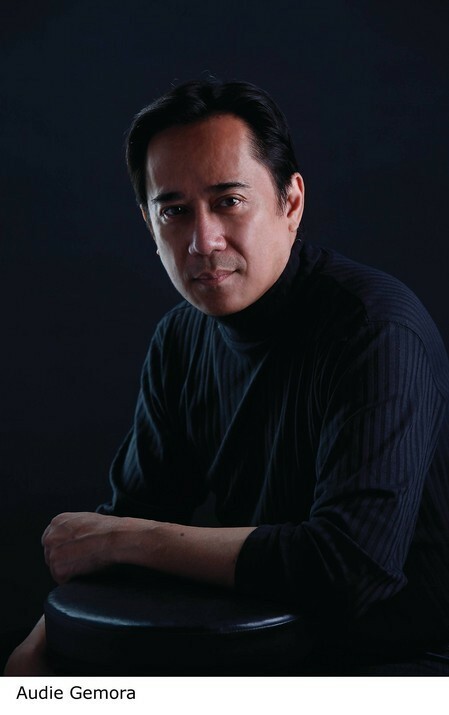 His latest baby is “Talent School of Academics and Art”, a K to 12 school in tandem with Maestro Ryan Cayabyab opening in June 2013. Capping the series on August 15 is “Leading Lady”, the third and last concert of the series featuring Menchu Lauchengco-Yulo. Menchu began her career in 1978 with Repertory Philippines. She has worked with other theater groups and production companies such as Trumpets, Atlantis Productions, Actor's Actor Incorporated and New Voice Productions. Recently, Menchu played the role of Anna Leonowens in Resorts World Manila's production of “The King and I”. She was also last seen the Atlantis production of the musical “Nine”. Last year, Menchu did a three-week run in Singapore of the play “The God of Carnage” where she garnered an Aliw Awards nomination for Best Actress in a Play. Her most recent directorial work, the musical “Jekyll and Hyde” opened to rave reviews. 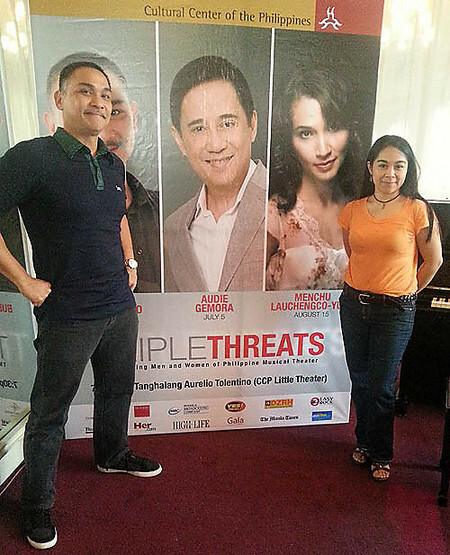 With this concert, Menchu celebrates her 35th year as a theater actress. 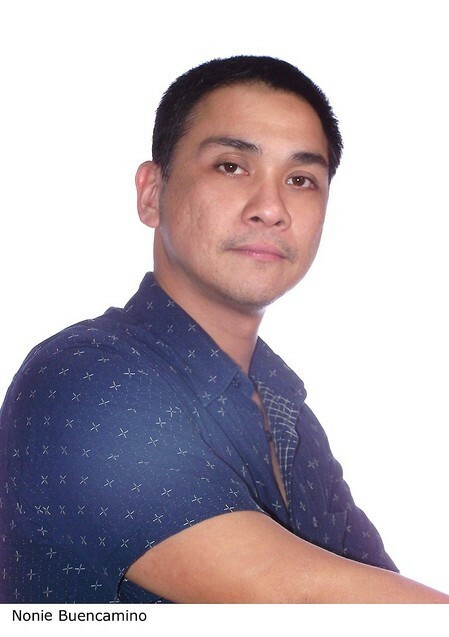 Musical director is Rony Fortich. TRIPLE THREATS: Leading Men and Women in Philippine Musical Theater is presented by the Cultural Center of the Philippines. Subscriptions to the three concerts are available at P1,500 for Orchestra Center and P1,200 for Orchestra Sides. Individual concert tickets are P800 for Orchestra Center and P600 for Orchestra Sides. The following standard discounts apply: 50% for students, 20% for Senior Citizen, Persons with Disabilities (PWDs), Military and Government Officials. All performances begin at 7:30pm at the Tanghalang Aurelio Tolentino (CCP Little Theater).